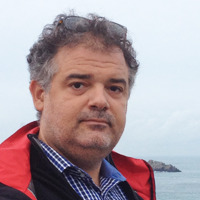 Achilleas Kemos is Policy and Project Officer within European Commission's Unit dealing with Network technologies, with a particular focus on standardisation activities. He has been Commission representative in the key technical bodies related to Internet Protocol (IP) standards issues and IP address allocation policies (IETF and RIPE respectively) since 2012, bridging policy considerations with technology issues. In his career with the European Commission he has dealt with issues on Internet Governance, managing the High level Group on Internet Governance, ITU relations, Network and Information Security, and Digital broadcasting, where he was instrumental in the adoption of the "HD-ready" logo and HDTV interoperability. He holds a degree on Electronic Engineering from University College London, and post-graduate degrees in European Business Engineering and Project Management from the French Telecommunications University (ENSTB) and Université Rennes 1 respectively.